A video shot at 9am on Tuesday morning (1st March) by a volunteer from Help Refugees shows a young Iranian Kurdish couple peacefully protesting their eviction before being forced to the ground and beaten with batons by police. They have since been arrested. The husband was screaming that his wife was pregnant. 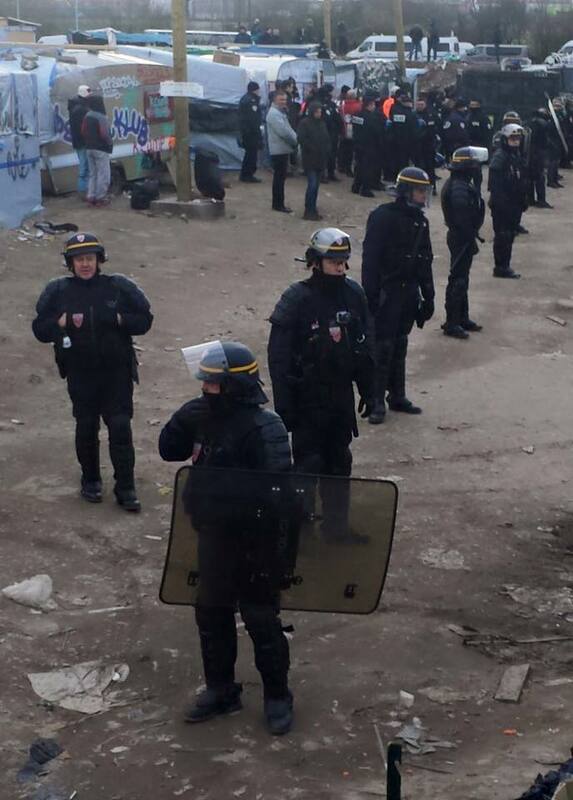 Riot police officers returned to the ‘Jungle’ camp to continue demolishing the rest of the makeshift shelters. The dramatic confrontation occurred as riot police offices continued to demolish the rest of the around 100 makeshift homes in the so-called ‘Jungle’ were torn to the ground yesterday, with bulldozers likely to continue clearing the southern area home to home to 3455 people. Since Monday (29th February), the French authorities have been dismantling shelters using crowbars, mallets and Stanley knives. Refugees are not allowed access to this area and some have had their belongings taken away from them. Videos and photographs have been circulating online documenting the brutality of the French police as they continue to use tear gas and rubber pellets against the migrants and refugees during the eviction. The Worldwide Tribe, who have been supporting refugees in Calais and Lesvos and reporting from the ground, posted a message on its Facebook page. It said: “The tear gas meant people ran from their homes in pain, unable to see to collect their belongings. Their shelters were then systematically destroyed with chainsaws and mallets. Following the arrival of the 50 riot vans grassroots charity with a water cannon, volunteers from the grassroots charity, Help Refugees, expressed their anger at the mistreatment of migrants. “Refugees in one small section of the camp (mainly Iranian) were given one hour to leave before their shelters were dismantled with chainsaws. They were threatened with arrest if they did not leave. “There are coaches available to take residents to CAO’s (accommodation centres, reportedly in Montpellier in this instance). Everyone is bewildered. Many have simply left, on foot, taking nothing with them, just a sleeping bag. Our teams are were being blocked from entering the camp. We are trying to meet refugees on the road to hand out emergency packs. 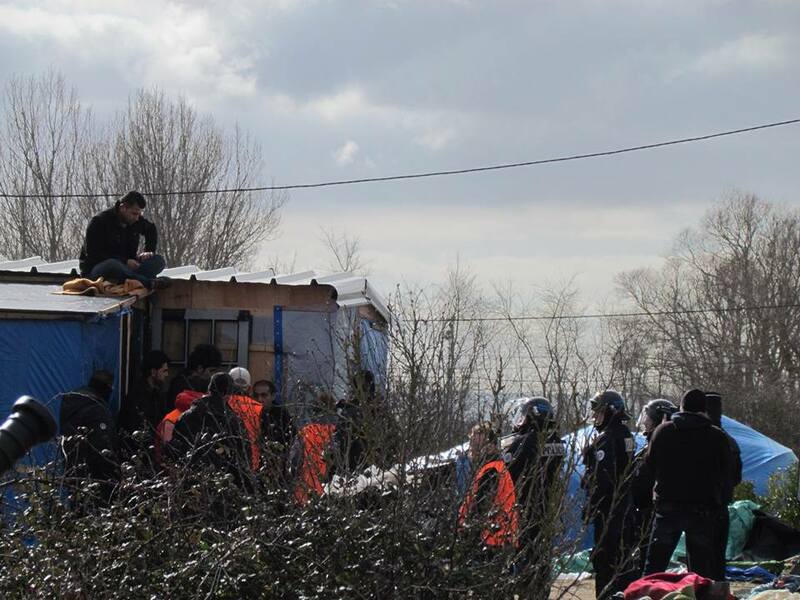 These scenes do not ring true with the humanitarian methods of eviction that the French Minister of the Interior, Bernard Cazenove, spoke of last week. In a press conference last week, the authorities said there would be no bulldozers. However, eyewitnesses reported how the police were forcefully removing people from the only homes they know and destroying them as other vulnerable and terrified migrants and children look on. While others returned back from the toilet to find their shelters had been destroyed. Help Refugees/ L’Auberge des Migrants are the only organisation to have carried out a full census of the Calais camp. They say that the French authorities have only ever made estimates. According to their figures, the total camp population at 5,497. The survey found 445 children — of whom 305 are unaccompanied minors (90 have family in the UK) — live in the section that is being destroyed right now. This means there is nowhere near enough alternative accommodation being provided for the numbers that are being made homeless. The authorities confirmed that across the whole of France, as of last week, there were only 1156 alternative accommodation available for refugees. However, many people are refusing to move into the government-built containers as it requires registration, which involves being fingerprinted and forcing them to claim Asylum in France, when a lot of migrants wish to be reunited with their family in the UK. Others are also reluctant to move because of the lack of communal spaces, movement is restricted and the fear they will be separated from their families. 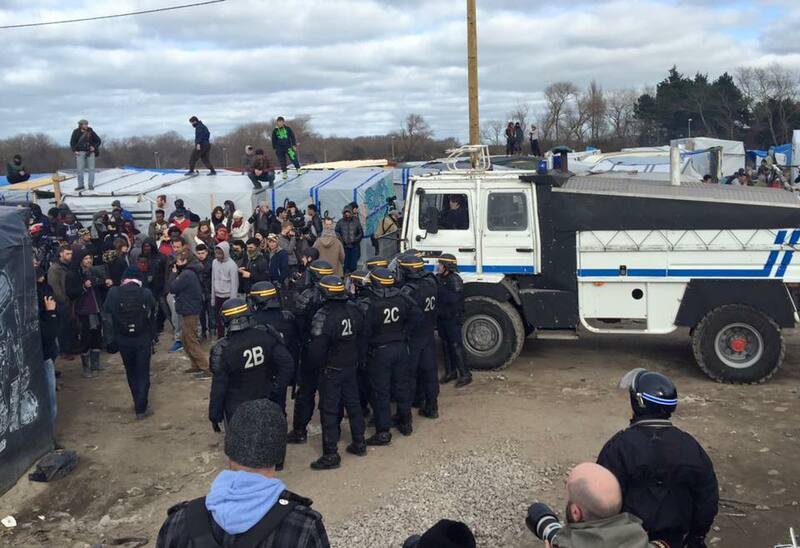 The ‘evacuation’ of the Calais camp is expected to carry on all this week. The French official have said once the southern section of the camp has cleared, the will begin bulldozing the northern section, which houses 2042 residents. 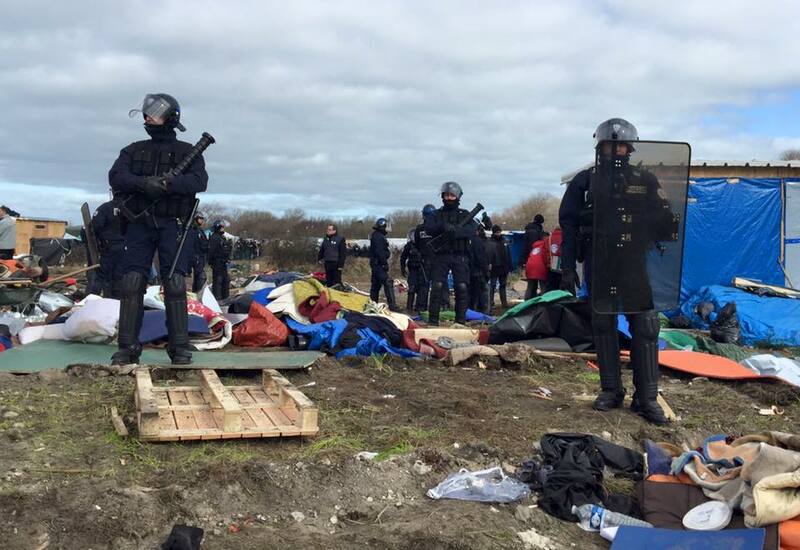 Care4Calais recently released a statement condemning how the French authorities have handled recent evictions in the Calais Jungle. “In a press conference last week the Prefecture assured journalists that the dismantling of the southern part of the camp would be gradual, humane and respectful to the dignity of the people living in the camp. The Minister of the Interior, Bernard Cazenove, reiterated this insisting the approach would be humanitarian. The lawyer from the Prefecture at the hearing last Tuesday said that the two key reasons for evacuating the Jungle were the dignity of refugees and their security. “The scenes of panic reported yesterday were a far cry from these commitments. The aggressive way in which this demolition was carried out increases the psychological pressure on the refugees in the camp, majority of whom have already been traumatised. “The authorities’ show of force with over 200 police officers in full body armour with batons and shields is in complete contradiction to what was promised by the Prefect and the French Minster of the Interior. “If the intention truly was, as stated, to move people to better accommodation why the excessive haste to destroy existing homes? Why not move people out then return in four weeks’ time for the clearance? Instead, yesterday, we saw people being forced from homes that were immediately destroyed before their eyes. The objective is clearly the destruction of the camp. “The refugees were told they had one hour to leave their homes or they would be arrested. Many were escorted from the homes by armed police. We consider this approach to be extremely confrontational and unnecessarily provocative to people who have already suffered so much. “It was confirmed in the French court that only 1156 alternative accommodation places were currently available in Calais and throughout France. The Jungle is home to over 5000 refugees of which 3,455 live in this southern section alone. “The levels of violence seen in the camp yesterday were completely disproportionate. Over 200 police with prevalent firing of tear gas and use of water cannons. There are over 5000 people in the camp including families with young children, elderly people and unaccompanied children. “Turning their communities into a war zone is dangerous, terrifying and not at all necessary. Many of our volunteers were in the camp all day yesterday and all commented that the only time they felt afraid was from the French police.